A Full-length safety crossbar an angle iron brace is integrated into the rear of the bar for maximum support. Self-lubricating nylon bushings eliminate friction between the inner and outer arms. Competing tow bars use steel on steel which is subject to binding and corrosion. 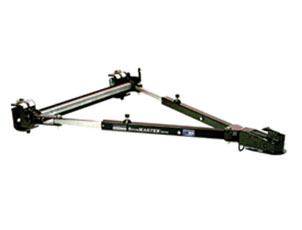 Roadmaster's Autowlok Locking Mechanism allows both tow bar arms to extend or retract for a quick connection. Then, as you drive away, the arms self-center and automatically lock. The Roadmaster Stowmaster tow bar incorporates a built-in safety strap that will prevent the separation of the tow bar in the unlikely event the primary lock should not function. There's nothing like built-in peace of mind. Plug-welded tow bar arms — steel plugs seal both ends of the tow bar, preventing corrosion from moisture and debris. Finally, Roadmaster style the high tech powder coat finish provides maximum durability and looks great on any vehicle. Incorporates nylon bushings for self lubrication. Roadmaster's Autowlok locking mechanism allows both tow bar arms to extend or retract for a quick connection. Do you need Roadmaster Tow Bar Brackets to go with your new Roadmaster Tow Bar? Use our bracket finder by clicking below. We have installed images of the tow bar brackets on most vehicles and have installation instructions for each bracket. Let us know if you have any questions.